If there's one word that captures the price of silver performance last week, it's volatility. Silver prices began the previous trading week on a softer note, then jumped as the U.S. dollar plunged. Shortly afterward, prices rapidly declined as the dollar regained strength. But that dollar strength turned out to be temporary. U.S. Federal Reserve Chair Janet Yellen's testimony wreaked havoc on both the dollar and the silver price during Wednesday's session. However, after the market digested these inputs, the price of silver managed to close the week up 1.1% from the Monday, Feb. 13, open of $17.91. Yellen's talk of three possible 2017 interest rate hikes – combined with rising inflation data – pushed silver above $18 for the first time since Nov. 10. So what does that imply for silver prices going forward? I still think the metal has plenty more upside potential in 2017. In fact, my new silver price prediction shows the metal gaining at least 21.5% later this year. On Monday, Feb. 13, the silver price opened at $17.91. It quickly caved to selling pressure as the dollar climbed above 101. Silver settled at $17.80 for a loss of 0.6% on the day. Silver prices saw sharp swings on Tuesday thanks to more movement in the dollar. They peaked near $18.02 in early morning trading in response to a softening dollar. But the greenback reversed and got stronger, dragging the price of silver down to $17.79 before noon. It eventually gained 0.7% to close at $17.92. Yellen's testimony to the House Financial Services Committee on Wednesday influenced the dollar and silver. 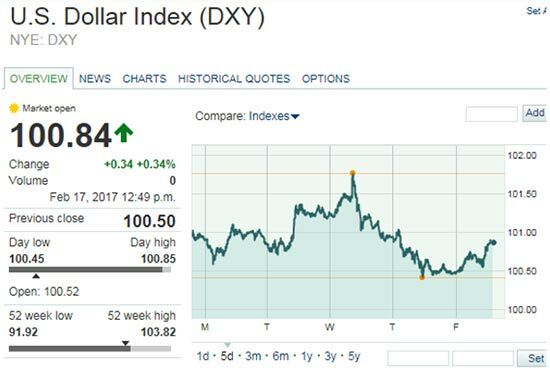 Her teasing three 2017 rate hikes sent the dollar surging, which weighed down the price of silver. The silver price weakened in the morning down to $17.79. But buyers got the upper hand once the U.S. Dollar Index peaked near 101.75. From there, silver prices gained 0.2% on the day to close out at $17.95. On Thursday, Feb. 16, silver prices jumped higher once the market digested Yellen's comments. Traders started to price in a weaker dollar as the effects of the rate hike statements briefly wore off. The price of silver logged a 0.6% gain and settled at $18.06. Renewed strength in the dollar on Friday weighed silver prices down for most of the session. The metal opened lower $17.99 but pushed higher later in the day to close at $18.10. With that, silver posted a weekly gain of 1.1%. There's no doubting the importance of silver closing above the psychologically significant $18 level last week. That's because the $18 mark is extremely close to silver's 200-day moving average – an important indicator of where prices are headed this year.